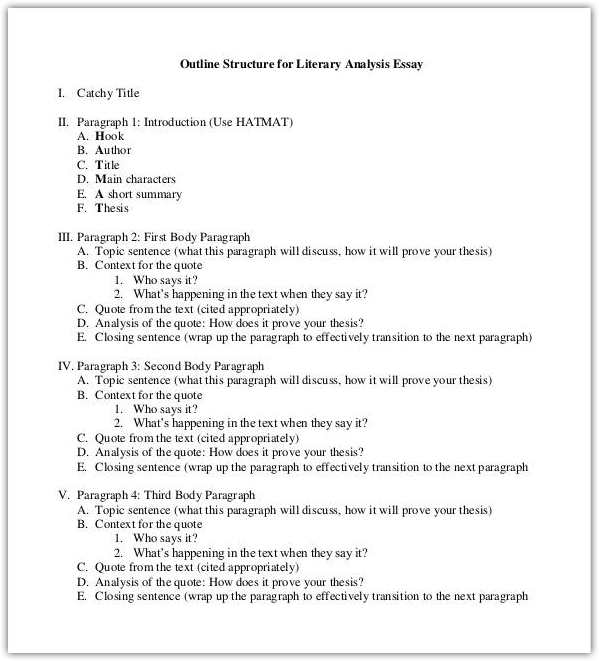 How to Prepare a Professional Analytical Essay? 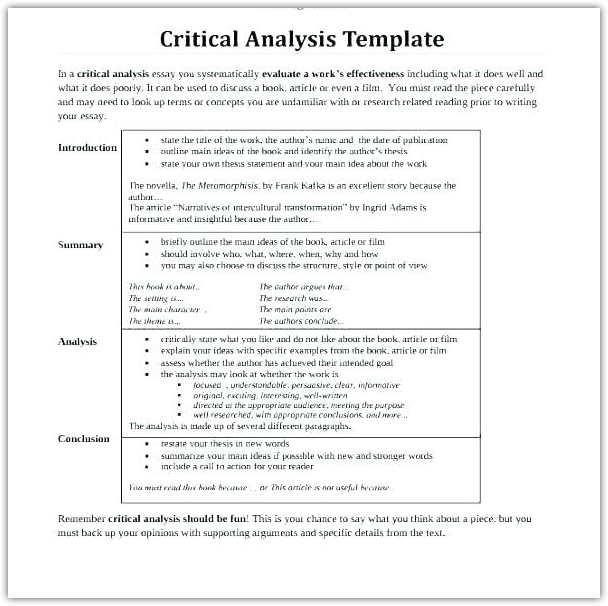 An analytical essay is a complex academic assignment that requires proper storytelling and an ability to think critically. This type of paper is an extremely important work, which is usually conducted by the writers who need to provide analytical essay itself or include it to argumentative or synthesis essay paper. Every writer needs a writing plan when preparing an analytical essay, thus an outline remains an important element of the paper that helps organize the entire writing process. Moreover, it is crucial to use only reliable sources and materials in order to prepare a great final paper. It is important to remember that an analytical essay remains a separate type of paper that requires critical thinking and numerous analyses conducted. Therefore, it can never be a simple summary. First, when you start preparing an analytical essay, make sure you know what are you dealing with, thus check its definition first. Second, check the assigned formatting style in order to provide a paper with proper format and shape. You can use professional online help to deal with your assignment more rapidly. An analytical essay is a type of essay paper that requires a profound analysis of an examined issue. 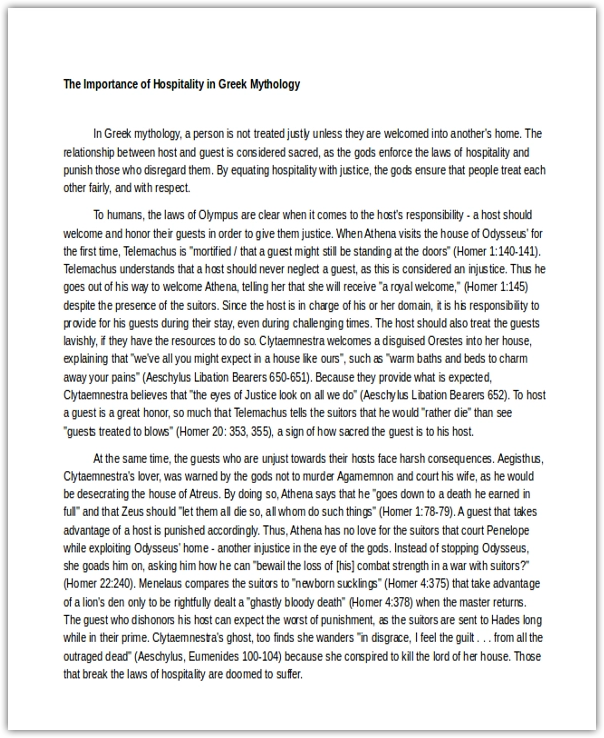 In addition, this type of essay reveals numerous arguments, which must be always supported by up-to-date reliable evidence. The analytical work can be performed about any issue, including movies, events, etc. This paper needs a real analytical work to be done since the simple summary of the facts can never be called an analytical essay. When dealing with the paper, it is important to check every element, including the author’s special writing style, tone, etc. If you want to find out how to write a perfect analytical essay, it is important to check various tutorials and guides online. 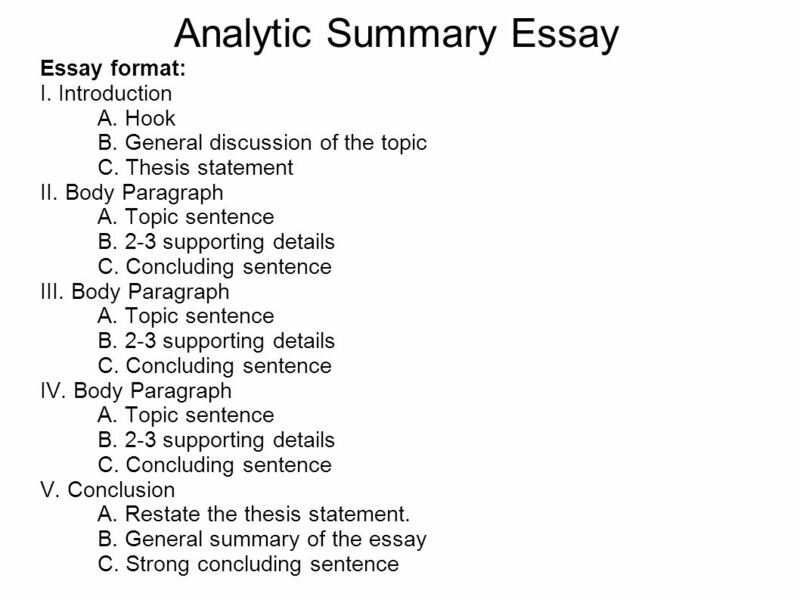 Since analytical essay remains an academic paper, writers often analyze the assigned topics. In the same time, if you have a chance to choose a persuasive speech topic, you should do it. It may help you to prepare a better final paper. Still, choosing a proper topic is quite a difficult task since it can greatly influence your writing process. You must always choose the topic you are familiar with and which you are interested to write about, no matter what discipline it concerns. Therefore, in order to prepare a perfect analytical essay, you need first to choose the best topic, and second, learn how to create the main parts of the paper. Use the following guide to prepare a successful essay paper. Every essay paper requires a proper essay topic. Moreover, the paper needs a thesis statement to be revealed in the first few paragraphs of the essay. The analytical paper requires the best thesis. It is important to have enough knowledge and gather enough up-to-date materials and sources to create arguments. If you want to persuade the reader or write an essay online, you need to provide a strong thesis statement and arguments. When you are writing a thesis statement, make sure to reveal the main idea of the entire paper. It is great to learn various literary terms and ways to analyze a content first. It is important to remember that the thesis statement is never too general. Better narrow it down according to the assigned topic and field of study. The analytical essay outline is an essential part of the paper since it allows organizing the entire writing process better. 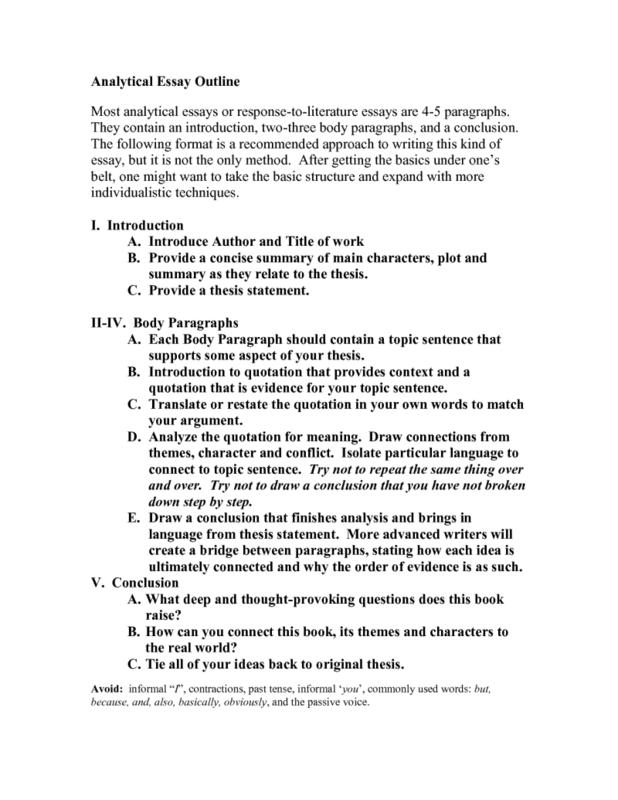 The outline is a structured list of the essay paper’s main elements. It allows putting the things in proper order and saves a time needed for a paper performing. You need to prepare an outline before starting to write a draft. It will allow you to organize the entire writing process more professionally and will let create a logical structure of the analytical essay. With a proper outline, it is easy to perform a good analytical work, with proper elements, format, and conclusions. The entire analytical essay requires another three key elements, including an introduction, a body part, and a conclusion. This is the traditional structure of a good analytical essay. Mostly, students prepare three- or five-paragraph essay papers. Topic sentence #3 that includes the argument and supporting evidence. The introduction is an essential part of an essay paper. This is the first information the readers get once reaching the paper. The introduction needs to be attention-grabbing and quite informative for the audience to find out the main topic of 500 word essay paper and the thesis statement. In order to provide a good introduction, it is recommended to include the background information, hook sentence, and the thesis statement. Introduction always includes the presentation of the topic. First, writers provide some hook sentences to gather the reader’s attention. Further, it is good to provide background information to let readers find out what the entire story is about and bring them closer to the main thesis. When providing a thesis statement, you need to show readers why your analytical paper matters and what results it can possibly bring. In the introduction, you put the links to the main arguments presented in the next body part. You can use various literature methods to provide good arguments and strong supporting evidence. You can use any of the relevant sources and materials, including popular Internet sources. In addition, you can find much analytical work’s examples online and use them to prepare your own analytical essay. Make sure to provide a bright introduction of an essay paper and let the audience find your paper interesting from the very first words! Once conducting all the needed analyses, writing down main arguments and supporting evidence, it is a high time to provide conclusions. Since the conclusions also need a critical approach, they need to include a short summary, thesis statement recall, and final results/thoughts. Moreover, never forget to use proper transition words and phrases to show the entire paper logical order. After writing down the main results, it is good to prepare the one- or two-paragraph conclusions. It is important to come up with own thoughts and final ideas, and show a unique point of view. The students also can provide some predictions or recommendations. It is good to put recommendations into the last few sentences. When you need to analyze a poem, it is important to follow the next tips and guides in order to provide a good analytical essay. Select the poem you think to be very creative and unique. Choose the poem on your own or use the assigned by the tutor. Write down the main points and try to distinguish the writer’s main tone and writing style. Try to find the hidden meaning of the poem. Write down an analytical outline, introduction, body parts, and a conclusion. Restate the writer’s thesis statement. Provide a proper bibliography list. With our professional guides and useful tips, you can learn easily how to prepare a great analytical essay with proper format, focuses, and main elements emphasized. In a case you have no time to perform great analytical work or annotated bibliography, you can use professional help. You can get the best advice on how to choose the best topic for analytical essay paper for high school, college or university. In case you lack great writing talents, online assistance can be very beneficial for you as well. Use the services of professional services that provide expert online assistance and enjoy great results in a few days. The professional writers will perform your excellent analytical essay and will allow you to save your time gaining the best results eventually.